Bonnie joined JISAO in the fall of 2013, first as a postdoctoral research associate, and now as a research scientist, working with John Bullister (NOAA-PMEL) and Rolf Sonnerup (JISAO). She is interested in understanding how microbes in the ocean use nitrogen, an essential element for life. Her current research projects look at how nitrogen enters the ocean (nitrogen fixation), is cycled (nitrous oxide production and consumption), and leaves the ocean (denitrification and anammox). Bonnie studied chemistry at the University of Virginia for her undergraduate degree, but it was during a summer internship at the University of Delaware, College of Marine Studies, while working on a project looking at groundwater seepage to an estuary, that she discovered her interest in marine chemistry. She went on to work as a laboratory and field technician at the University of North Carolina – Chapel Hill, Institute of Marine sciences where she collected and analyzed many samples from the Neuse River and Pamlico Sound. From there, Bonnie moved across the country to attend graduate school at the University of Washington, School of Oceanography, studying the loss of nitrogen from the ocean. 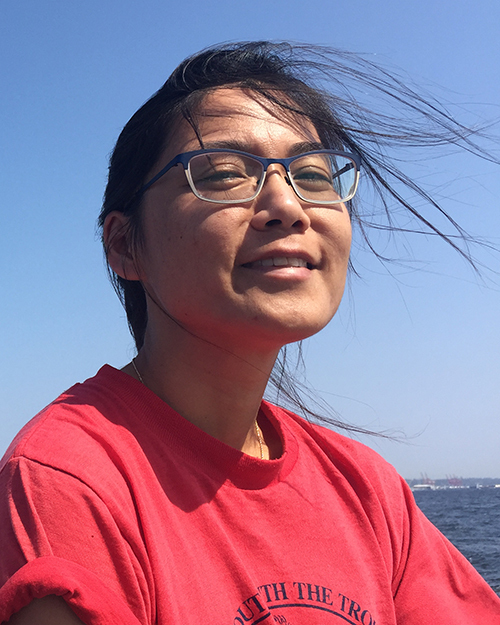 After that, she went back to the east coast for a postdoctoral stint at Princeton University, where she continued working on facets of the marine nitrogen cycle. Then in 2013, Bonnie was delighted to return to the west coast and the University of Washington. What aspect of your role do you enjoy most? I am very fortunate that my position as a research scientist at JISAO has a lot of variety. I get to develop new research projects, build collaborations, carry out field and lab work, and scrutinize the results to help contribute to understanding the world around us. I get to learn new things, visit interesting and remote places, and meet new people all the time. It keeps life very interesting. I’ve worked in every ocean on Earth and have crossed the Arctic Circle once, the Antarctic Circle twice, and the Equator four times on research ships. Antarctica! I want to see those tabular icebergs and the ice shelves and glaciers they calve off of up close. The aurora australis would be nice too. Maybe some penguins. On the way to Antarctica, I’d probably try to swing by South Georgia and Elephant Islands, which were notable stops on one of the most amazing sea adventures of all time: the voyage of the Endurance. Any hobbies and interests do you have outside of work? Sailing, hiking, badminton, and cooking dinners with friends.